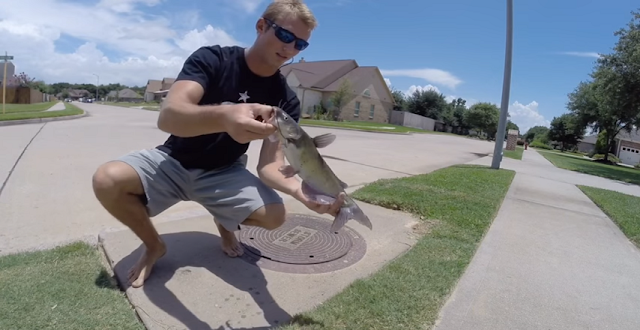 Home › videos › Viral › Who’s Hungry For Sewer Fish? Who’s Hungry For Sewer Fish? Yeah, it’s a storm sewer but have you seen what ends up in storm sewers? 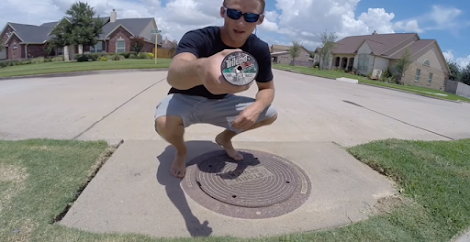 A teenager in Katy, Texas, has one of the most unique—and oddest—fishing holes you’ll ever see and it’s located just off the sidewalk near his house. Kyle Naegeli, 16, goes sewer fishing through the holes of the storm drain manhole cover. Naegeli baits a hook, puts it through a hole in the manhole cover, and drops it down into the water of the storm sewer below. A cork attached to the line above prevents losing the line. Then he waits. Naegeli pulls the fish up to the manhole cover, then reaches into the opening from the street to grab the fish.